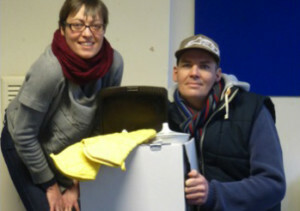 THE first families to receive packs of donated kitchen equipment say thank you to Fair Frome and the many people who have donated kitchen utensils for their project. The packs equip local people with basic kitchen utensils, which will help them cook and share meals at home. The pilot project, set up earlier this month, which provides both local individuals and families with packs of practical equipment, has been well received by donors and recipients. The project has also been supported by ASDA who donated colanders and tin openers, and have pledged their support and wished Fair Frome good luck with the project, and local business Millers, who have also supported the project. The packs include knives, forks, spoons and plates so that families can eat together, and saucepans, wooden spoons, potato peelers, mixing bowls, whisks, chopping boards and much more to enable families to cook meals at home. Donations can be taken to the Fair Frome Hub, situated at 5 Palmer Street, Monday, Tuesday and Thursday 10.00am-12.00noon. If you would like to know more about receiving a kitchen pack or volunteering with Fair Frome please contact Nikki Cox nikki.frome@gmail.com or tel: 07714 587129.